Cost To Install a Fence in my Garden? Garden fencing is one of the simple additions that will make a phenomenal difference to your home’s appeal. Imagine all the summers you will spend in the garden and having a pristine, upright garden fence to look at. But as we all know all garden fence installation can be a challenge. Are you up to it? Do you possess all the knowledge and skills to carry out an impressive job; because if you do then you stand to save on fencing costs. However, if you feel you’d rather sit back and let the professionals do an amazing job for you then this article will give you an idea of garden fence costs and the steps involved in fence installation. It is worth mentioning that any prices discussed in this article are a guide only as other factors on the ground (literally) will affect the total you can expect to pay including the cost of fence panels you choose, the size of your garden plus many more factors. Is a strong and durable type of fence which is slightly more expensive than lap panel fencing. The panels come in standard 1.83m lengths and a range of heights. It is made up of vertical boards which overlap and are strengthened by horizontal rails at the bottom, top and in the middle. Costs average £30 per panel in the standard 1.8m x 0.9m size. The most popular type of fencing and is made up of horizontal timber slats which overlap to give a sturdy panel. They are relatively easy to use to erect a garden fence or replace broken panels. The cost is considerably lower than close board fences, an average of £20 per panel. If you are looking for a more decorative fence to enhance your garden, then lattice panels will do the job. Due to the intricacy of the design the panel cost is significantly higher. Prices will vary on length and height just like the other fence types. The type of fence panels you choose. The size and number of panels needed for the job. The type of posts you select, wooden or concrete. Type of gravel board to be used (it is recommended gravel boards are fitted to protect the fence panels from rot). The type of ground (soft or hard) which will influence how much ground preparation and postcrete is required to ensure a sturdy fence. Removal of the old fence, waste disposal and any gardening tidy up required. Your chosen contractor should be upfront about all the costs involved and you should ask for an itemisation of all the aspects. This is crucial because it allows you to critically compare different quotes on a like-for-like basis. Also, make sure you check the fencing contractors are insured, provide a warranty for their service, and belong to a professional organisation. An example of such a body is the Association of Fencing Industries and their website is afiorg.uk. Making this a requirement allows you to weed out the cowboys and safeguard against shoddy work. Once you have settled on a preferred contractor ensure the price you have been quoted is the price you will pay. After spending a lot of money in having a new fence installed, you should make sure you have a plan in place to ensure your fence is properly maintained. Although the fence is usually pressure treated and can withstand the elements, having a layer of waterproofing is a great way to increase its life. Depending on when you have your fence installed, it is general practice to allow the wood to dry out for a couple of weeks before applying a stain or treatment. 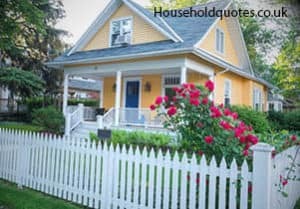 This article has hopefully provided ideas on the various types of fences available on the market, and roughly how much you can expect to pay for a new fence. As mentioned earlier, fence costs will depend on a number of factors, including the type of fence and the size of your garden. Requesting several quotes will allow you to choose the best possible price for a given specification. Finding a fencing contractor is made much easier by using Quotatis. All you need to do is post your job with as much detail as possible and interested contractors will contact you. You will then be able to review their profiles and read what their previous customers have said, before hiring them.